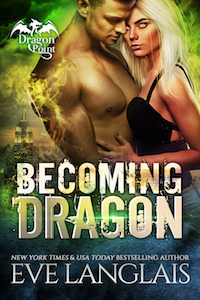 Becoming Dragon is book 1 in the Dragon Point series. I've tried a book or two of ELanglais in the past and enjoyed so I got excited when I saw this series available at my library. I'll probably wind up binge listening to these when I get a chance soon. Aimi is a dragon shifter that's getting a lot of pressure from her family to settle down and select a mate. Imagine her surprise to find an unclaimed dragon male on a rooftop one night. Brandon, the male in question is in hiding after escaping a medical institution that he was experimented on. He can't shift back into his human form and is stuck in a big scaly beast body, not knowing it's a hybrid dragon form. Aimi's instantly attracted to Brandon and they form a bond of sorts that grows throughout the novel. They find one another again after the initial rooftop meeting and Aimi and her family try to help Brandon shift back to human form though no one is sure how long that will last. He and Aimi are now on a mission to rescue his sister that was taken, and in exchange for the favor he'll become Aimi's mate. There's dragons, lots of fighting and a lovely romance in this story and I couldn't get enough! Becoming Dragon is a quick listen that just affirmed I need more dragon paranormal romance books in my life. ELanglais has a lovely sense of humor that shines through in her novels and it just makes reading her books so much fun. If you're a fan of Paranormal Romance with dragons you'll love this book.